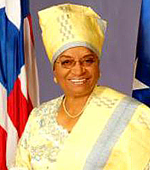 On April 12, 2012 our Atlanta Sister Girl News reporter, Candace Bazemore, interviewed Liberia’s Vice President H.E. Joseph Boakai and Honorary Consul General Cynthia Blandford Nash about the recent Liberia and U.S. Business Summit at Hartsfield-Jackson International Airport just before the Vice President returned to Liberia. The Honorary Consul General of the Republic of Liberia- Georgia, in collaboration with the Liberian Embassy, Washington, D.C., hosted the Liberia and U.S. Business Summit: A Rising Star in the Emerging Market on Friday, March 30, 2012, in Atlanta, Georgia at the Robert W. Woodruff Library, Atlanta University Center, 111 James P. Brawley Dr., SW, Atlanta, Georgia, which was co-hosted by Clark Atlanta University. At the business summits a stellar array of invited guests and presenters provided an economic development framework and opportunities for U.S. businesses in the fields of commerce and industry, petroleum refinery, municipal water and waste management, investment opportunities and investment incentives and to learn about starting and growing a business in Liberia. Liberian Government officials in attendance will include: H. E. Joseph Nyuma Boakai, Vice President, Republic of Liberia, Hon. William V. S. Bull, Liberian Ambassador to the U. S., Hon. Cynthia Blandford Nash, Honorary Consul General, Republic of Liberia (Georgia), Hon. Miata Beysolow, Minister of Commerce & Industry, the Hon. Ciata Bishop, Executive Director, National Investment Commission, Hon. T. Nelson Williams, Managing Director, Liberian Petroleum Refinery Company, the Hon. Mary Broh, Acting Mayor of the Monrovia City Corporation & the Liberian Chamber of Commerce.